I just finished The Students Are Watching: Schools and the Moral Contract by Theodore and Nancy Sizer. Turns out it’s a great read for an evening when tomorrow’s snow day has already been called. I’ve been thinking periodically about the hidden curriculum that all schools impart to their students, and their chapter categories resonated: modeling, grappling, bluffing, sorting, shoving, and fearing. Where do I allow students to grapple with complex, un-solvable concepts? When do I discourage that behavior, and why? When do I “shove” into the academic and personal lives of my students, even if they protest? Does it work, or does it backfire? Do I induce fear in my students? Intentionally or unintentionally? Does this help or harm their work? How about our relationships? I love thinking about this stuff. I’m fortunate to work in a building that allows me to address it explicitly with my students, and also with a staff that also wants to have these conversations. There’s a danger, though, as well — if I think about it too much, I end up down the rabbit hole, over-analyzing every move that I make in the classroom, not to mention the hidden moral lessons being imparted by the larger school system (and in Philadelphia, that gets real depressing real quick). And yet — in my sixth year of teaching, I can cautiously report that I’m getting better at that balance. This entry was posted in Big Picture, Curriculum, Ethic of Care and tagged Hidden Curriculum, Moral Education, Nancy Sizer, Ted Sizer on January 3, 2014 by lpahomov. Building thesis statements out of family comparisons. One of the bigger challenges to this project is getting students to look beyond simple “they are similar in x way” or “they are different in y way” statements, and think about the larger trends that can be identified by drawing a line from the older text to the modern one. In what ways are you similar to your parents? In what ways are you different? We then spun these into statements, where students had to either emphasize the similarity or the difference based on the order of the statements. 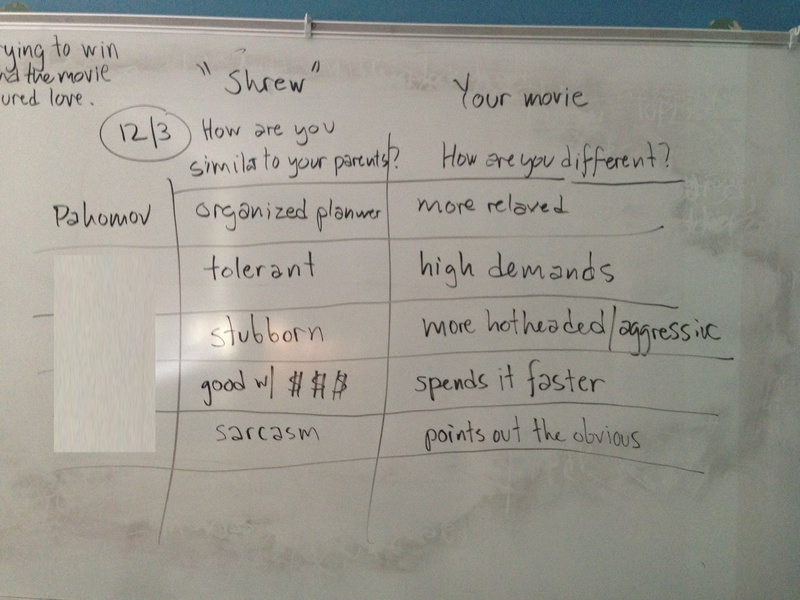 We then applied that nuance to comparing “Taming of the Shrew” and our selected movies. First off, students had to decide: in what ways did the romantic comedy they watched differ from the play? And did those differences outweigh the similarities? 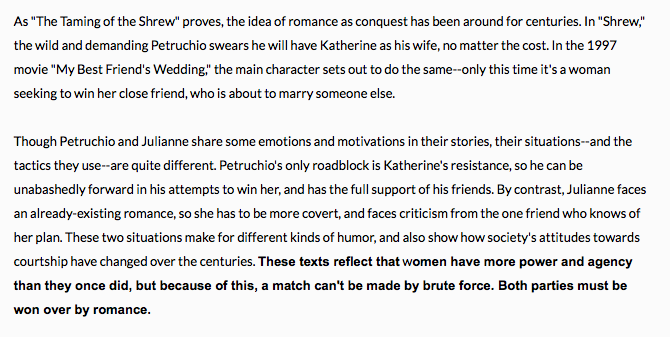 Could they observe a change in attitudes about love and marriage comparing these two texts? Or are we, the viewers, enjoying the exact same beliefs and ideas that we did 400 years ago? Am I saying that the two texts are more similar or different? What do I think the implications of that statement are? The work they are asked to do ramps up quite a bit here. But I think the family statements activity could apply to any number of analytical projects, especially anything that asks students to look at change over time. Students spend so much time in the compare/contrast dichotomy, and are rarely asked to describe how things got from one extreme to the other — or alternately, how they only seemed to change. 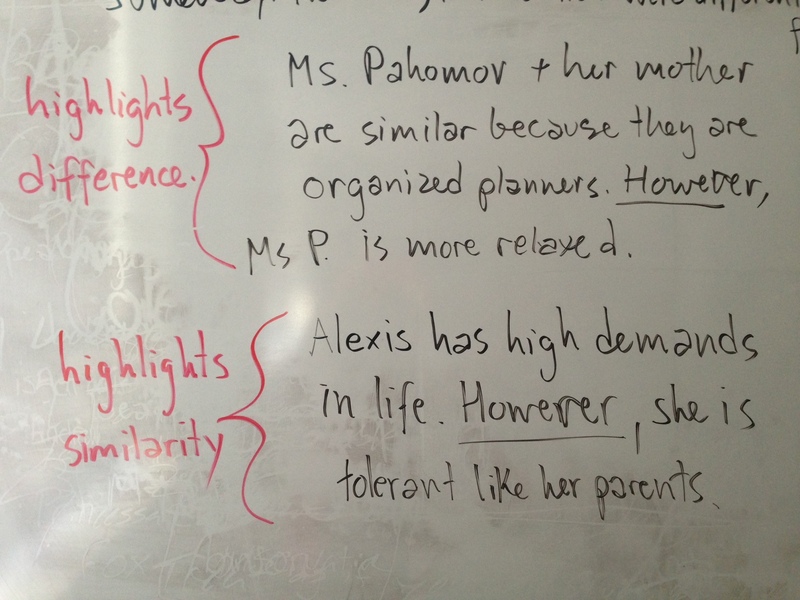 This entry was posted in Curriculum, Writing on December 10, 2013 by lpahomov. #Engchat and Teacher Action Group for Social Justice. I am beyond thrilled to be co-hosting the next #engchat! This Monday, October 14th, Teacher Action Group will be hosting this week’s discussion around the theme of social justice education. What’s more, this chat will not just be on Twitter — it will also be a live meet-up at Fado, located at 1500 Locust Street. Come join us starting at 6:30 for some in person discussion before the session begins at 7pm! Students learn to read and write in English class. They practice their methods of observation, analysis, and response. But does school give them a chance to apply those skills to the real world and its problems? This week’s #engchat will focus on how teachers can facilitate social justice education in their classrooms. Now more than ever, students are living in a world where their lives are marked by inequality–in income, resources, and opportunity. No matter their situation in life, students can benefit from turning the critical lenses learned in English class towards their “real life.” The chat will be a space to discuss both the big picture theory behind social justice as well as tips and tricks on how to facilitate meaningful lessons and activities in school. Not an English teacher? The topics discussed in this week’s chat will be for all teachers — so join us! Outside of Philadelphia? Follow the hashtag #engchat on Twitter, starting Monday at 7PM. This entry was posted in Big Picture, Curriculum, Professional Development, SLA on October 8, 2013 by lpahomov. I had big plans to post some back to school activities on this blog. Now it’s October. 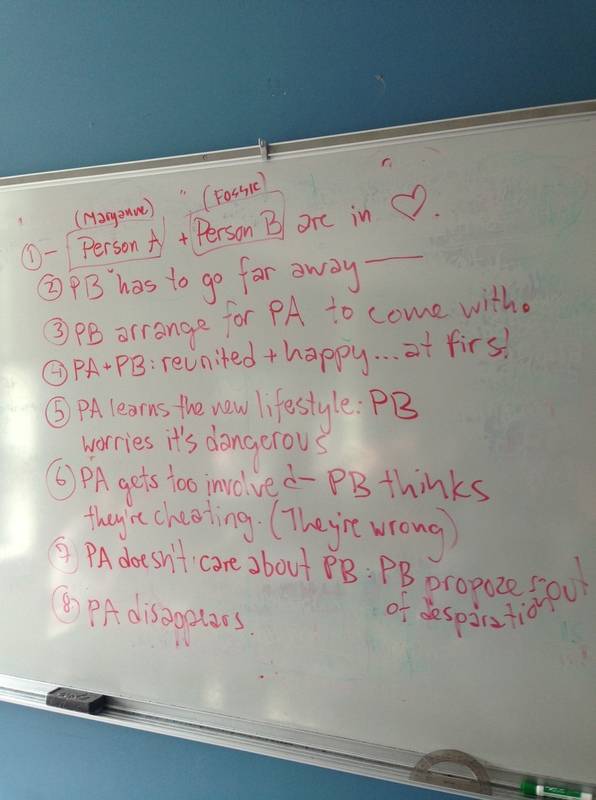 After reading the chapter “Sweetheart of The Song Tra Bong,” students had figure out the main plot points of the story, but by making it “universal” — no mention of the characters or setting, just some generic titles. We used “Person A” and “Person B” for Mark Fossie and Maryanne. Is this a war story? No. This is a break-up story. Based on our “universal story” version of “Sweetheart of the Song Tra Bong” discussed in class, it is your task to write a remix of that story. The basic conflicts, events, and resolution must stay the same, but the topical situation (names, places, dates, details) must change. Start by coming up with a new setting for the story, and decide who or what the characters will be. (Hint: some of the most creative versions will have non-human characters.) Then tell the story of the break-up! O’Brien’s focus on storytelling makes this activity especially illuminating, but you could do it with any text. Boil it down and then start again from there. We’re all telling the same story, so how are you going to make yours good? This entry was posted in Curriculum, SLA, Unit Plan, Writing on October 3, 2013 by lpahomov. A number of our students have chosen to get early dismissal from their families and attend a rally organized by the Philadelphia Student Union. As a result, a number of us were also left in school — which made Keystone Exam prep not the wisest option for the day. So, what did we do instead? We crafted our own responses to the projected school district budget shortfall. Richard wrote a letter describing his concerns about losing the Engineering program at SLA. Reggie is seeking individual stories from students about the cuts, to compile into a document. Allen is worried that basketball will be cut next year — and he also doesn’t think that his voice will be heard on this. Lloyd described his love of computers, and how SLA has helped his skills grow. Alaina created a digital poster and also wrote about her experience with Computer Science at SLA. The ultimate message — you are free to decide how you need to respond to these budget cuts, but the most effective stories are the specific ones. It may be counterintuitive, but these details have the most universal reach. This entry was posted in Big Picture, Curriculum, SLA on May 9, 2013 by lpahomov. Writing Without Teachers, College Essay Edition. I took a page from my earlier reading of Writing Without Teachers for this one. I mean that literally — I dug out the photocopies I made in the fall, when we were doing messy personal narrative essays responding to “The Things They Carried,” — only this time it was in preparation for college application essays. I’ve got some great slideshows and prompts for getting their brains started on writing a good college essay, but I wanted to shift gears a little bit with the final product. I will read mediocre essays, but I certainly don’t want admissions committees reading the stuff that students turn into me when they haven’t done their best work. This needed to be an all-or-nothing deal, one where students got down and dirty with the writing process until something really great came forth. On Monday, 5/6 you need to bring a complete draft of your college essay to class. That draft may be messy, and disorganized, and too long — but it needs to feel complete. An incomplete paper will make class on Monday very difficult for you. Once you have conferenced in class, I will then set you up with an appointment with an outside expert editor. This might be in person or via e-mail. Once you send your draft to your editor, you are on their schedule — so the final deadline for this assignment is several weeks away, and you will have to maintain communication with them and then revise on your own. Separate written reflection describing how your writing changed — what were you trying to say at the beginning, and how has the message changed? How has your writing changed? This assignment will also be graded differently from typical high school writing assignments — there is no such thing as “not good enough” or “just-so-so-because-I-slacked” for your college application essay. There’s either excellent, or not ready to be turned in yet. This assignment is worth 25 points total — and will be marked either “credit” or “missing” in the grade book. When you have accomplished all of the items on the list (to a level that satisfies Ms. Pahomov when she looks it over) then it will be marked credit. I feel like this is a classic “try to make the grade book as though it’s not there” move. I hope it works. Oh, and those outside expert editors? All people from my PWN — professional writerly network. This entry was posted in Curriculum, SLA, Writing and tagged college essay writing, outside editors, Peter Elbow, Writing Without Teachers on May 7, 2013 by lpahomov. How can we best teach context for quotes? Beautiful, or beastly? Click on the image to go see the flow chart so far. One aspect of composition that consistently troubles my students (and vexes me) is introducing outside sources in a paper. For a literary essay, the rules are relatively simple: make sure you include the text title and author somewhere, give us a little plot background so we can understand what’s going on, etc. But for non-fiction analytical writing, the variety of sources available makes identifying proper and adequate context for a quote much more difficult. How exactly should one quote a comment on a YouTube video? Do I need to include the author’s name here? Should this detail be quoted directly or just summarized? After the first reference, they refer to this person by their first name only. They include context for the information after it is presented, not before. At first, it seemed like an advanced algorithm that you learned over time — eventually your intuition would tell you that you needed to write “New York Times Columnist David Brooks” and not just “David.” But “just wait ’til your older” is hardly an instructional method. The best idea I have right now? A flow chart. Me and a few of my SAT’s are currently hashing out as many iterations of citing sources we can think of, and then we will try to create an easy-to-follow chart as best we can. Is this going to work? I really don’t know. It could turn out to be an awesome tool, or it could be messy and incomprehensible. But go ahead and check out our draft so far. Leave comments here if you have any ideas or edits. This entry was posted in Big Picture, Curriculum, SLA, Writing and tagged 2Fers, context for quotes, writing instructions on April 15, 2013 by lpahomov.